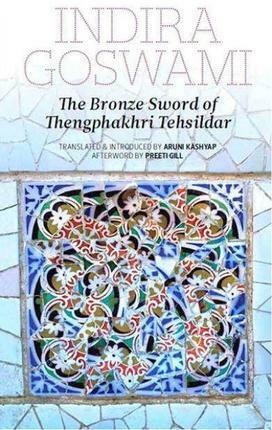 Indira Goswami’s last work of fiction, The Bronze Sword of Thengphakhri Tehsildar is the heroic tale of a Bodo freedom fighter who was, arguably, the first woman revenue collector, a tehsildar, in British India. Set in late 19th-century Assam, Thengphakhri is a fascinating character that the author recreated from folklore and songs and stories that she’d heard in her childhood. The image of the protagonist, galloping across the plains of Bijni kingdom in lower Assam to collect taxes for the British, is a compelling one and one that inspires awe and admiration. A big part of what makes the novel interesting, then, is what it doesn’t tell us. Beyond a couple of fleeting references to a husband we know nothing about Thengphakhri’s status as a widow.